This black generation has The Black Panther and my generation of the 70’s had Superfly. Both movies had incredibly creative soundtracks, Superfly produced by Curtis Mayfield and The Black Panther produced by Kendrick Lamar. Both movies had superhero type characters Youngblood Priest and T’Challa who faced insurmountable odds. Both had albums cuts that had the word “dead” Freddie and King. Both movies were created to be supported by primarily black audiences with primarily black casts. Also, both movies were extremely well received by the black community. 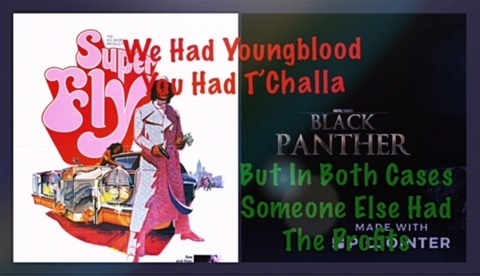 One movie Superfly although themed around drugs, as well as prostitution, was about black redemption in an urban setting while The Black Panther is set in a mythical black nation that has a redeeming powerful Black character. The other key significant similarity is that the white movie monopolized industry will profit most from both movies. So as much as things seemingly change things truly indeed remain economically the same for black communities. Enjoy the movie though.